This report provides an overview of current situation in Port-au-Prince and Croix-des-Bouquets districts, Haiti. DMC satellite imagery acquired on the 03rd November 2012 and pre-crisis DMC satellite imagery acquired on 23rd November 2012 have been used for this report. As a complement and example, UAVs images, extracted from an IOM mission in Haiti along Rivière Grise are shown in this report. Tropical storm Sandy passed across Haiti on 23rd October 2012. Heavy rains caused flash floods, landslides and damages to infrastructure. 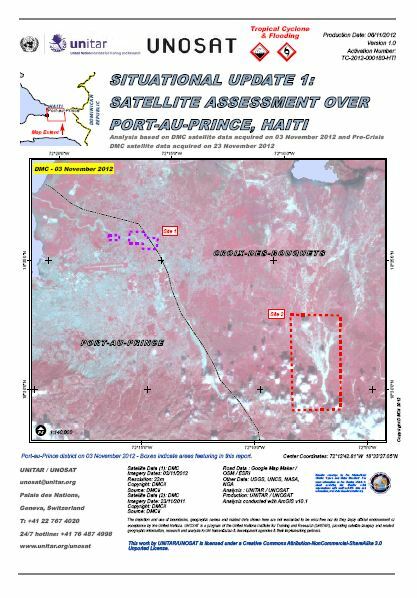 Geographic datasets produced for this assessment and additional UNOSAT products are available at http://www.unitar.org/unosat/maps. This report is part of an on-going satellite monitoring program of UNITAR / UNOSAT in support of international humanitarian assistance and created to respond to the needs of UN agencies and their partners. This is assessment has not yet been validated in the field. Please send feedback to UNITAR/UNOSAT at the contact information below.